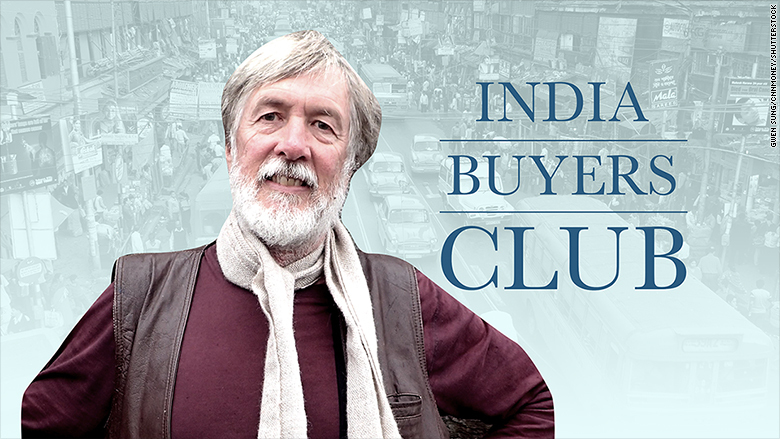 Greg Jefferys, a 62-year-old Australian, helps run an India-based buyers club. A growing number of sick Americans are traveling thousands of miles to India. Why? For huge discounts on prescription drugs. Scores of life-saving medicines are sold for much lower prices in India, attracting foreigners who have been denied access to, or can't afford, them at home. It's not an easy path. Foreigners must navigate the country's health care system, reams of paperwork and a language barrier. But for many, including Gregg Bigsby, a commercial fisherman from Alaska, coming to India felt like the only option. Bigsby had been living with Hepatitis C for more than 40 years when the disease stepped up its attack on his body. His liver was damaged and scarred, almost to the point of cirrhosis. The fisherman's doctor recommended treatment that included a drug called sofosbuvir. But Medicare denied Bigsby's insurance claim, and he couldn't afford to pay hundreds of thousands of dollars for the drug. So Bigsby went online to contact an India-based "buyers club" -- a group that exploits wrinkles in international patent law and drug regulation in order to supply cheap medicine to people in need. Globally, more than 130 million people are estimated to be living with Hepatitis C. Left untreated, the disease can be deadly. But sofosbuvir, released in late 2013 by U.S. biopharmaceutical firm Gilead (GILD), is effectively a cure. It's also expensive, costing $84,000 for a 12-week course in the U.S. Doctors often prescribe the drug -- sold under the brand names Sovaldi and Harvoni -- in combination with others, further raising the overall cost of treatment. As a result, insurers and government healthcare providers often pay for its use in only their sickest patients. 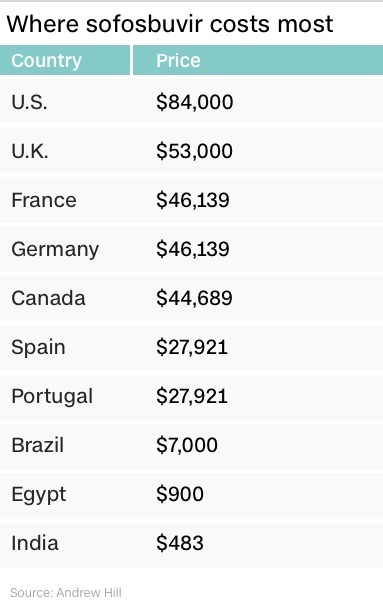 But in India, a 12-week course of the drug's generic version can be purchased for just $500. Bigsby first made contact with the "buyers club" through a blog written by Greg Jefferys, an Australian who also suffered from Hepatitis C. The posts recounted Jefferys' 2015 trip to Chennai, an Indian city on the Bay of Bengal, to buy sofosbuvir. It wasn't long before the story of Jefferys' trip to India spread, and he began receiving emails from people all the over world. He jumped in, learning as much as he could about India's pharmacy system. Soon, he had developed a network of contacts in the country and found himself at the center of an informal "buyers club." The mild-mannered Jefferys shares little with the swaggering, medicine smuggling cowboy played by Matthew McConaughey in the 2013 film Dallas Buyers Club -- but he is angry. "There's millions of people with this disease in the world," Jefferys said. "People are dying because a really cheap drug is being marked up." Jefferys says he gets up to 100 emails per day from people seeking advice -- half of them from America. Some travel to India to purchase the drugs themselves; others ask Jefferys to arrange for the drugs to be mailed to their homes. There are limits on the value and amount of drugs that can be legally exported from India. Some of the group's shipments have been seized, but so far they have avoided major legal trouble. How much should a drug cost? Drug pricing has come under intense public scrutiny in the U.S. after Martin Shkreli, as CEO of Turing Pharmaceuticals, hiked the price of a medication used by HIV/AIDS patients from $13.50 to $750 per pill, earning him broad condemnation. Much of the controversy has focused on drugs that are used by relatively few people. Sofosbuvir, however, is in a different class. "There are drugs that are a lot more expensive, but this is the really the first time we saw a drug that was this expensive for this large of a population," said Steve Miller, the chief medical officer at pharmacy benefits manager Express Scripts. 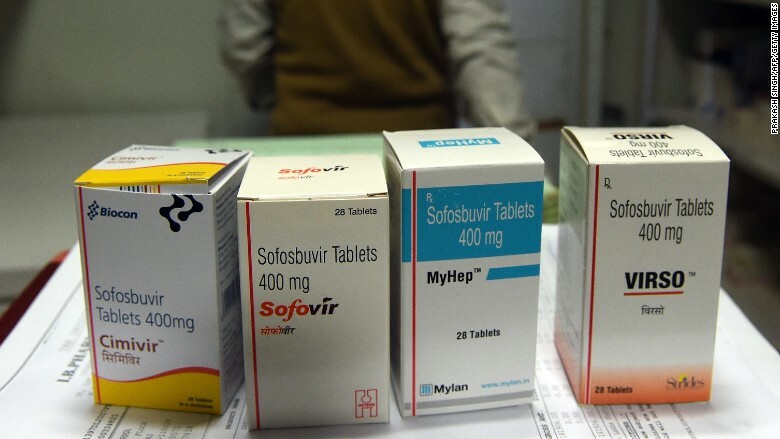 Sofosbuvir has been a huge success for Gilead, which paid $11.2 billion to acquire its developer. Last year, the line of drugs accounted for roughly two thirds of the company's $32.2 billion in sales. In an effort to protect market share in the face of competing new drugs, Gilead has begun to offer deep discounts on the $84,000 prescription. Critics, however, insist the price is still far too high. "How egregious is the price on a scale of one to 10? It's like a 35," said Tracy Swan, the Hepatitis/HIV project director at Treatment Action Group. Gilead said in a statement that it "responsibly and thoughtfully" priced the drug, and that "prices today are less than the cost of prior standard of care regimen." The company has also established a program that helps patients purchase the drug if they meet certain income, residency and coverage criteria. Generic sofosbuvir for sale at a pharmacy in India. India's patent laws have long been a thorn in the side of global pharmaceutical companies. Unlike other countries, India does not award patents for minor improvements to existing drugs, and instead forces developers to prove they have made a significant scientific advancement. "India has been the torchbearer of trying to show countries that there can be innovation and invention in the field, but making sure that unmerited patents don't get granted," said Tahir Amin, co-founder at the Initiative for Medicines, Access, & Knowledge. The pharmaceutical industry and U.S. government have lobbied fiercely against India's rules. They scored a major victory in May, when regulators reversed course and approved one of Gilead's patent applications on sofosbuvir. Advocates, who are appealing the decision, fear the precedent could disrupt global access to other expensive drugs. "This is the end of the era of India being the pharmacy of the developing world," said Leena Menghaney, the head of Medecins Sans Frontieres' access campaign in South Asia. Bigsby, the fisherman, was on a plane to India just one week after exchanging messages with Jefferys. In Chennai, he was able to purchase sofosbuvir, in combination with other drugs, for just $1,600. After a few months, tests showed that Bigsby's Hepatitis C virus has disappeared. "[India allows] foreigners to come in and buy the medicine because it's very humanitarian," said Bigsby. "Americans just want the money."